Apparently the average person in Britain puts on around 5lb over Christmas. I’d have been happy with that figure to be honest as unfortunately I exceeded it, quite significantly depending on the period of time we’re counting. Thanks to various events, Christmas menus, burgers etc.. I managed to put on over 7lb between Christmas Eve and New Years Day or 11lb since mid December. Oops. Luckily I’m pretty good at losing weight when I need to and have already managed to lose over a third of it in under a week. It’d been 10 days since I last set foot in a restaurant though and I was starting to get withdrawal symptoms. Would I be able to keep it up when I started eating out again? When i’m trying to be healthy at home I usually turn to Asian food so my first choice for a meal out that wouldn’t ruin my good work were places like Yuzu or Umezushi. Both great options but I decided to try something new and ended up at Vietnamese restaurant I Am Pho. Located on George Street in the heart of Chinatown I Am Pho was Manchester’s first Vietnamese restaurant. There’s an interesting selection of beers including authentic Vietnamese lager Hanoi Beer which I was desperate to try but somehow managed to resist. 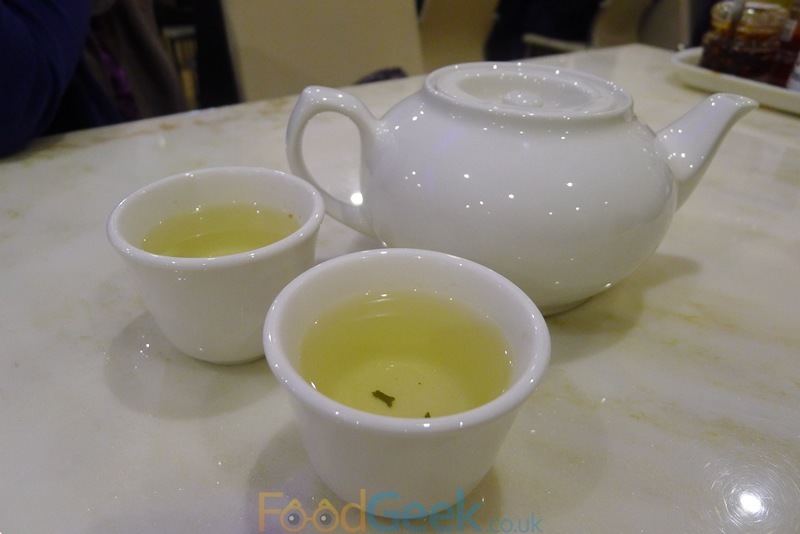 Instead I ordered a cleansing ‘Chinese Tea’ which was actually very nice. 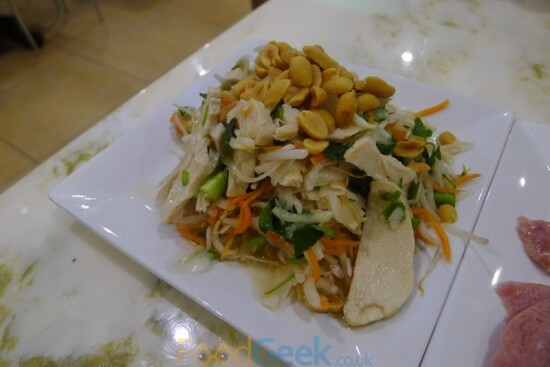 As was the food, starting with ‘Nom Goi’, a Vietnamese salad available with a number of toppings including beef jerky, prawns and chicken which we opted for. This is my kind of salad, full of flavour and texture. 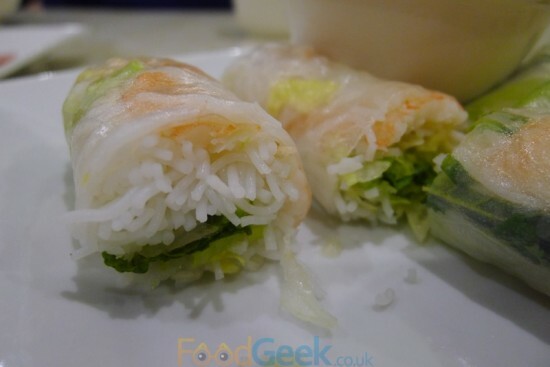 Crunchy, fresh and very tasty with a good balance of acidic lemon and salty fish sauce. The chicken was succulent and a generous portion, with the addition of Sriracha from the brilliant selection of condiments it was perfect. I liked the ‘Nem Cuon Tom’ even more. 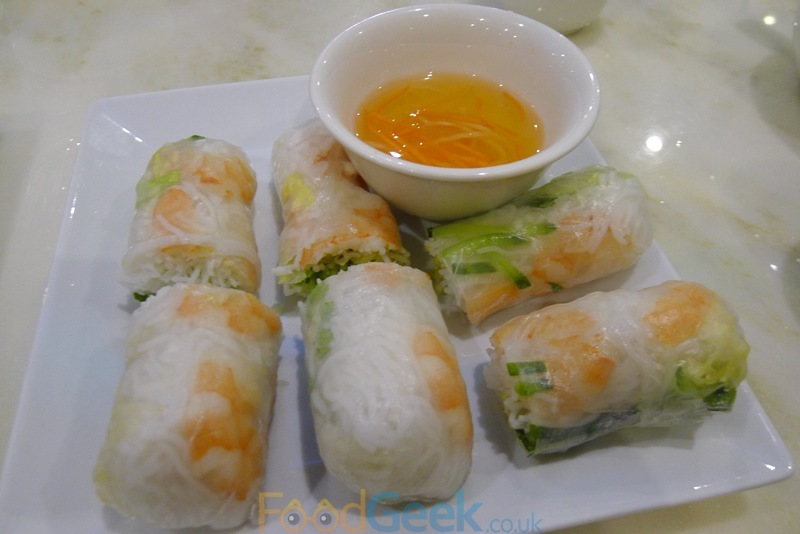 Vietnamese spring rolls made from very thin rice paper filled with shredded lettuce, herbs, vermicelli and prawn (also available with pork or tofu). They looked pretty and were absolutely delicious, so light and fresh with a lovely crunch. I’m looking forward to trying the other fillings. 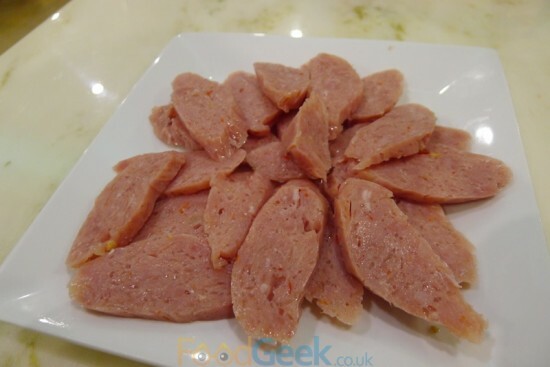 ‘Nem Chua’ is a Vietnamese style salami made from fermented pork. It’s an interesting taste which I liked but was disappointed it didn’t come served with the cucumber and coriander that i’ve seen in other reviews/photos. They would’ve given it a bit of contrast and freshness to lift the dish from simply a plate of meat. I also felt the portion size was way too big, not something I say very often but it’s a lot of meat and one of the more expensive appetisers at £5, i’d have preferred a smaller portion at £3 – £4. 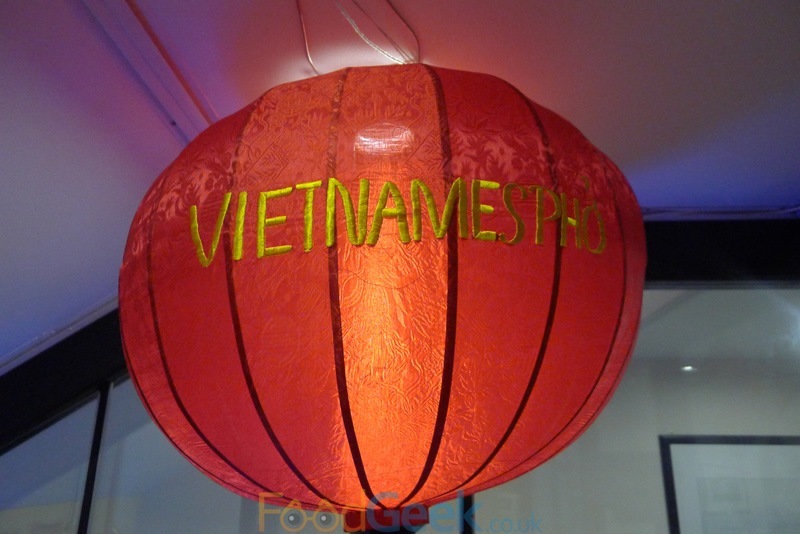 Unsurprisingly given the name, I Am Pho specialise in the famous Vietnamese noodle dish ‘Pho’ (as a food blogger it’s my duty to point out that it’s actually pronounced “fuh” rather than “foe”). 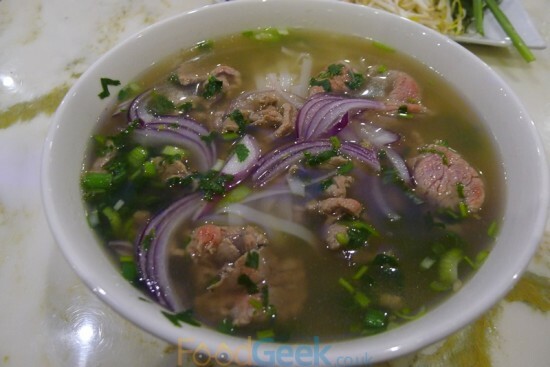 I had ‘Pho Bo Tai’, the noodle filled soup was topped with onions, coriander and slices of raw beef which cook lightly from the heat of the liquid. The broth itself was aromatic but needed a helping hand in terms of overall flavour. 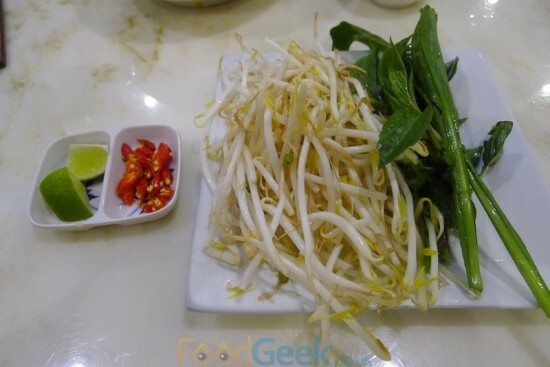 Firstly from the garnishes; lime, chilli, bean sprouts and thai basil and then from the condiments tray again. After adding most of the chilli & lime, a spoon full of beef paste, splash of fish sauce and squeeze of Sriracha it tasted fantastic. Meaty, hot, sour, sweet and spicy all at the same time with a great depth of flavour. 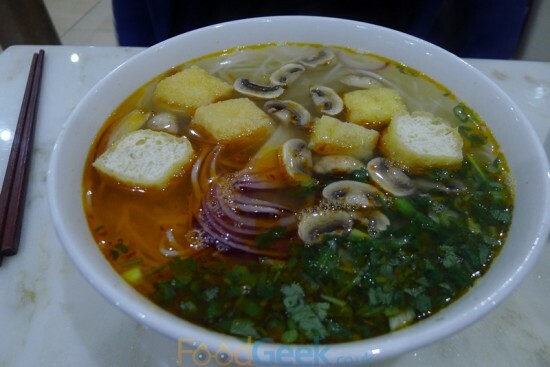 Mrs FoodGeek went for an even healthier option, ‘Bun Hue Chay’, much thinner bun noodles in a vegetarian stock topped with mushrooms and tofu. It was another enjoyable dish, the tofu in particular was excellent; fried to give a crispy exterior but inside was soft and spongy rather than the more common denser type. However, we both agreed that even with adding garnishes and condiments mine was slightly tastier. I couldn’t tell you whether they sell desserts or not as I didn’t trust my willpower enough to ask. I suspect not as I didn’t see anybody having them nor have I seen them in previous reviews or on their menus. Service was speedy, friendly and efficient. 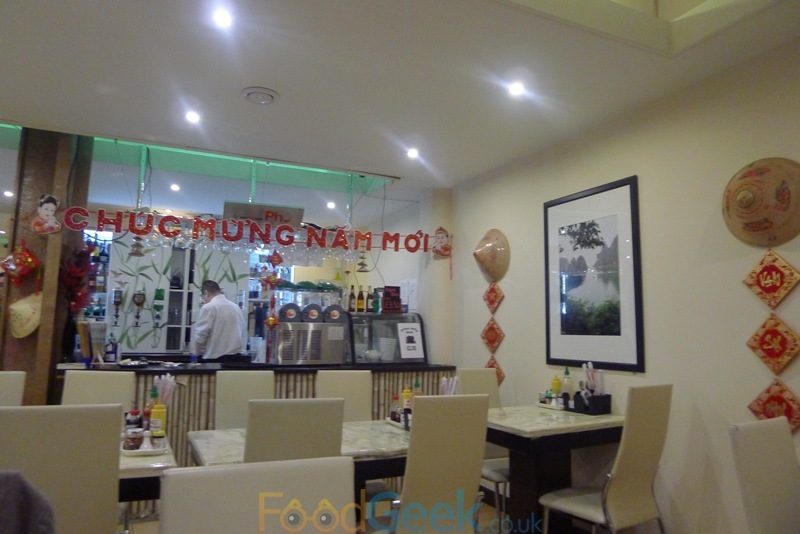 Although it wasn’t full during my visit but fairly busy for a late lunch on a Tuesday shortly after New Year. 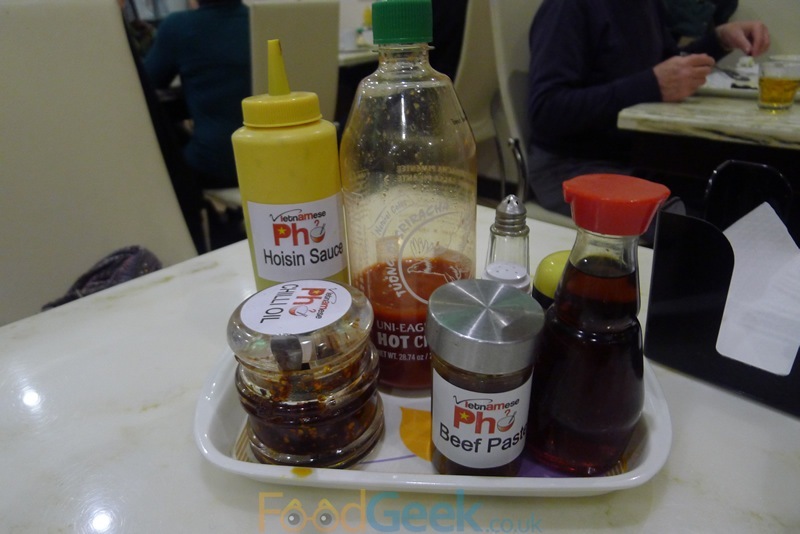 Overall we had a lovely time at I Am Pho, the food is good, staff friendly, it seems authentic and is very good value. It’s great to have another healthy and cheap option in Chinatown, i’m certain i’ll become a regular visitor, not just in January either.